Daniel Burnham of Chicago designed this 25-story skyscraper, commissioned by steel and coal magnate Henry W. Oliver. It was completed in 1910, in the Chicago school style with a T-shaped lobby of Italian marble and bronze similar to that of the Frick Building. The building boasts a three-story granite base with the upper 25 floors in terracotta. The building’s T-shaped lobby features polished marble floors and walls, reflecting light throughout the bronze window grills and elevator fittings. A Docent will be onsite to provide more information. 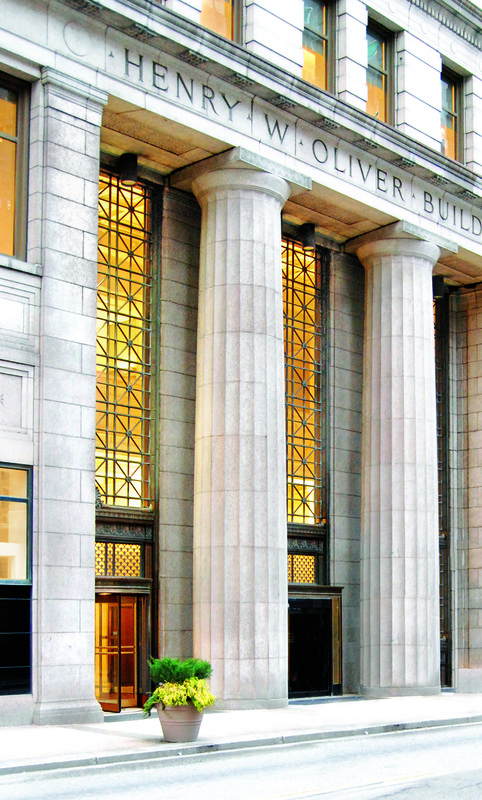 The Henry W. Oliver Building was built from 1907-1910 by Daniel Burnham. Before you enter, notice the impressive terra cotta clad over the steel frame structure. 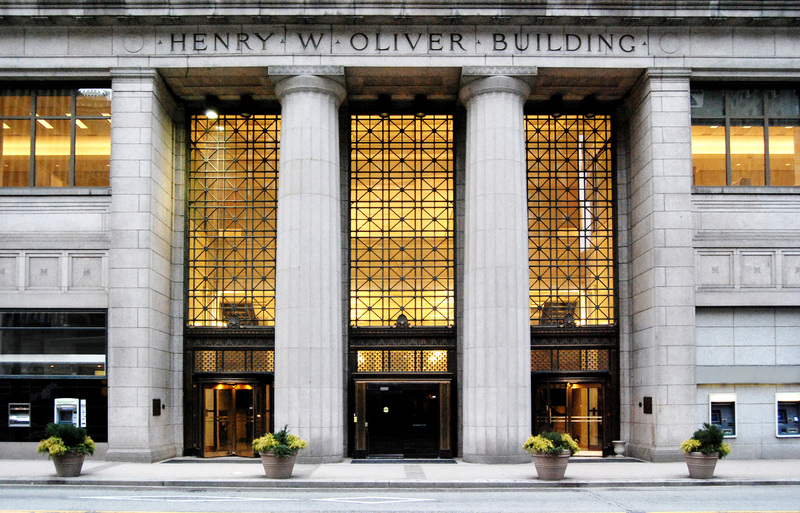 Henry Oliver planned that the building would serve to consolidate the management of his steel and coal operations, and as a way to leave a mark on the city’s growing skyline. In 2015 McKnight Realty Partners recently converted the top 11 floors of the building into the Embassy Suites, Hilton Downtown Pittsburgh. 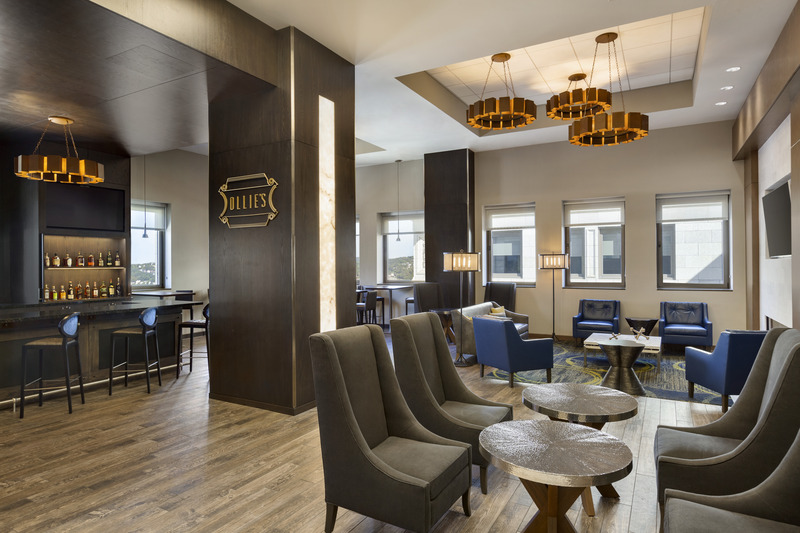 The hotel’s Sky Lobby on the 25th floor provides guests a memorable check-in experience, offering panoramic views of Pittsburgh from 348 feet up (be sure to visit the hotel after exploring the lobby of the Oliver Building).